The Laboratory for Vaccine and Immunotherapy Delivery (LVID), a.k.a. the Zaharoff Lab, in the Joint Department of Biomedical Engineering at NC State and UNC-Chapel Hill focuses on the development of innovative, translatable vaccine and immunotherapy delivery platforms that will have high clinical impact in an immediate timeframe. Our multidisciplinary research program utilizes the engineering design process to develop novel biomaterials-based strategies for localized immunotherapy delivery. Localized immunotherapy delivery is based on the principles that nearly all diseases can be managed through immunomodulation and that immunotherapies are safest and most effective if delivered directly to the affected tissue/organ. Our delivery systems exploit both natural and engineered biomaterials to control the context in which antigens and/or immunomodulators are introduced to the immune system. Controlling delivery allows us to: (1) manipulate duration and intensity of immune responses; (2) limit systemic side effects; and (3) overcome local inflamed or suppressed microenvironments. His paper builds upon his previous work demonstrated that heparin and heparin sulfate can enhance the activity of IL-12. Heparin chain length and degree of sulfation we found to be critical paramaters for enhancing IL-12. Based on these data he proposed a model of stabilization by which heparin enhances binding of IL-12 to its receptor subunits, IL-12Rbeta1 and IL12Rbeta2, which both have putative heparin binding domains. One of the goals of our lab is to train good people for their next position. In the immortal words of Bush43 “Mission accomplished!” Frank landed a cushy job as a Process Development Scientist at Grifols! We’d post a pic of Frank, but there are so few that it is quite possible that all of this has been a front for his real gig in the CIA. After a frantic finish which included a couple all nighters, Khue successfully defended his dissertation. He also rode a Cowfish and his dad came from Vietnam to see him walk. That’s what its all about kids. Khue likes North Carolina so much that he’s going to stick around as a postdoc. Asked if Santa new Buddy the Elf and he just gave a blank stare, mouth agape. If you don’t know who Buddy the Elf is, then you ain’t Santa. By the way, that’s a good money making scheme. How popular do you think a Buddy the Elf photo opp would be? It’s not her fault they took forever. Her paper shows that G-CSF can drive expansion of MDSCs which protects G-CSF secreting tumor cells from recognition and elimination by the immune system. If you knockout G-CSF, the highly aggressive 4T1 tumor model becomes quite immunogenic. Maura is a new PhD student. She is a Chemical Engineering grad from Notre Dame. She hails from the thriving metropolis of Boiling Springs, PA and was awarded the NC State Provost’s Fellowship. She likes Notre Dame football from February through December. Frank (Francis) B. Gillam, PhD, joins the lab as a postdoc. Frank returns to North Carolina, earning his PhD in Biomolecular Engineering from Virginia Tech where he was President of the Frank Beamer fan club. Frank grew up in Asheville and earne BS and MS degrees from NC State. Along with our University of Arkansas colleagues, Bhanu and Khue demonstrate that heparin serves as a co-receptor in order to enhance the bioactivity of IL-12. In addition, heparin is able to recover the IL-12 activity in cells in which both IL-12 receptor subunits have been functionally deleted. Leaving the nest....time to re-load!! Congratulations to Sean Smith for accepting a postdoc fellowship in the Hammond Lab at MIT!!!! 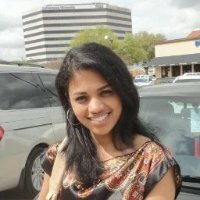 Congratulations to Bhanu Koppolu for accepting a position with BTG International!!!! With these departures, the Zaharoff Lab is looking for more graduate students and postdocs. An advertisement for one postdoctoral position is here. Congrats to Sean Smith for a successful defense of his dissertation!! They grow up so fast!! Sean Smith won 3rd place in the Engineering Division of the 12th Annual Graduate Research Symposium at NC State. He spent all of his winnings on diapers, like a good Dad-to-be. Double congrats, Sean and Emily!! We went to get our annual lab picture with Santa, as is our tradition, but the jolly old elf was taking a nap. So we had to improvise a little. Sruthi Ravindranathan successfully defends her dissertation! She is now off to do a postdoctoral fellowship in Dr. Edmund Waller's lab at Emory University. Congratulations and Best of Luck!!!! In his latest paper, Sean Smith characterizes the local and systemic immune response to intravesical immunotherapy of bladder cancer with chitosan/IL-12. The paper is Open Access on the OncoImmunology website or you can download it here. Sean's abstract was selected for a podium presentation in the "Emerging Technologies" session at the Society for Immunotherapy of Cancer (SITC) Annual meeting in National Harbor, MD. The session was well attended and most importantly, he got to eat at the iconic Ben's Chili Bowl in DC. The Z lab has moved to the Joint Department of Biomedical Engineering at the University of North Carolina-Chapel Hill and NC State University. We expect that this move will provide more opportunities to interface with oncologists and drive our cutting edge immunotherapies into the clinic. The goal is and always will be to eliminate the mortality and morbidity associated with cancer. Moving to North Carolina will help us achieve this goal. That said, we will miss our Arkansas colleagues and friends. Arkansas is a special place. Sean's team won the graduate division at the Donald W. Reynolds Tri-State Collegiate Business Plan Competition in Las Vegas. In addition to the $30,000 first place prize, they also received $2,000 for winning the graduate division elevator pitch competition. Read more here. A talented group of LVID undergraduate researchers are taking their tale. Seth Washispack enrolled in the accelerated MBA program in the Walton College of Business at U of A. Cassie Walker has accepted a position as a Consulting Analyst with Cerner Corporation. Kristina Maxwell will go to Wash U as a PhD student in Biomedical Engineering. Future physicians Jack Baltz and Annika Tabassum will enroll at UAMS. Tayler Pauls will go to Boston University as a PhD student in Biomedical Engineering. This paper settles a longstanding controversy over whether or not the ubiquitous biopolymer chitosan is immunogenic. Sruthi found that the wide varieties of chitosan from different vendors induce drastically different inflammatory responses. By painstakingly depyrogenating chitosan (i.e. removing endotoxins), Sruthi showed that pure chitosan is more or less immunologically inert. Sean & Co. win first place in the graduate division and $25,000 at the 2016 Donald W. Reynolds Governor’s Cup Collegiate Business Plan Competition. They also won the AT&T Elevator Pitch Contest for $2,000 and the Delta Plastics Innovation Award for $5,000. Read more here. 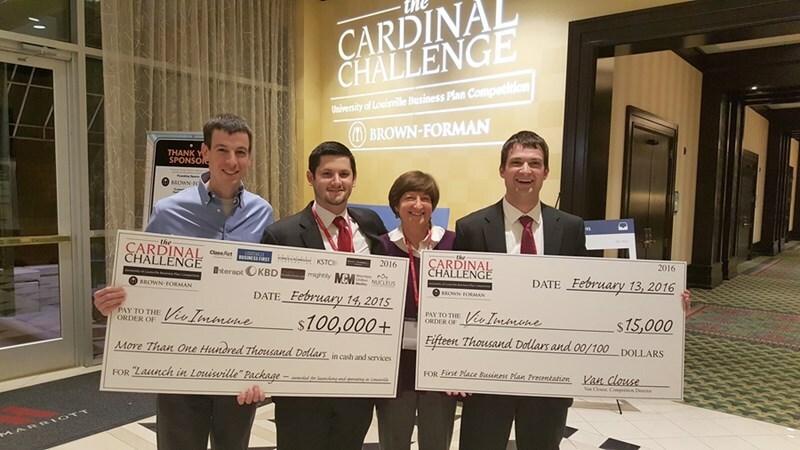 Sean Smith and colleagues at VivImmune took home $15,000 in cash plus $100,000 of in-kind prizes from the Brown-Forman Cardinal Challenge, a business plan competition at the University of Louisville. Read more here. This review makes a strong case for the development of new immunotherapies for non-muscle invasive bladder cancer that are capable of inducing tumor-specific immune responses. Welcome to the world Saanvi Koppolu!! Bhanu and Weiwei were jealous of Khue so they went and had a baby of their own!! Welcome to the world Maggie Nguyen!! Khue Nguyen and his wife have a 6lb baby girl. No CRISPR/Cas9 technology was used in the making of this baby! Congratulations to Kristina Maxwell for winning a Student Undergraduate Research Fellowship (SURF) for her project "G-CSF Knockdown Immunomodulation of Breast Cancer Cells for Whole Tumor Cell Vaccine." She will be learning CRISPR/Cas9 technology to knock-out G-CSF in 4T1 breast tumor cells. Sruthi Ravindranathan presented her data on breast tumor cell vaccines and immunosuppressive induced by myeloid-derived suppressor cells at the Society for Immunotherapy of Cancer (SITC) in National Harbor, MD and at the San Antonio Breast Cancer Symposium in San Antonio. Seth Washispack is selected as a "Senior of Significance" for the Class of 2016. This award is given to the top 2% of seniors at the University as determined by the faculty. Great news..Santa was awake this year!! Prior to visiting Santa, Kristina Maxwell, a.k.a. Turkey Tina, showed off her bowling skilz at a Z lab Lunch n' Bowl outing. Khue Nguyen, Kristina Maxwell, Jack Baltz, Seth Washispack and Tayler Pauls all hung posters at the Biomedical Engineering Society's Annual Meeting in Tampa, FL. Sean presents bladder cancer immunotherapy research to Elsa and Elmo! Sean Smith presented his most recent bladder immunotherapy findings at the Inaugural CRI-CIMT-EATI-AACR International Cancer Immunotherapy Conference in New York City. He even took time out of his busy schedule to make believers out of Elsa and Elmo! Olaf wasn't so interested. A one-year grant from the Arkansas Breast Cancer Research Program was award to the Zaharoff lab to determine if immune suppression induced by breast cancer can be reversed with cytokine adjuvant therapy following standard-of-care tumor resection. The long term goal of the study is to re-establish immune function in the breast cancer patient in order to prevent progressive recurrences and metastasis which is responsible for more than 90% of breast cancer deaths. Sean Smith embarks on a graduate internship in the Comparative Biology and Safety Sciences division of Amgen in South San Francisco. Khue Nguyen presented a posted titled: "Mechanisms of Cytokine and Chemokine Regulation Interleukin-12 elicits various responses of splenocytes from different mouse strains," at the American Association of Immunologist (AAI) 2015 Annual Meeting in New Orleans, LA. David Zaharoff was recognized by the College of Engineering with the Rising Star Faculty Award. The award is based classic metrics of scholastic activities (i.e., publications, impact, number of PhD and MS students graduated, extramural funding, patent submissions that lead to local economy development, prestigious awards like NSF, DOD, DOE, NIH career awards, etc.). David Zaharoff was recognized by the offices of the Provost and Vice Chancellor for Academic Affairs and Vice Provost for Research and Economic Development as one of the University of Arkansas' Top 15 most highly funded in fiscal year 2014. Congratulations to Michaela Mertz who was named Department of Biomedical Engineering Outstanding Senior for the Class of 2015. Michaela will pursue her PhD studies at the University of Florida in the fall. Graduating senior Michaela Mertz receives the National Science Foundation Graduate Research Fellowship Honorable Mention. As a recipient of funding support from the Women's Giving Circle, several Z lab members make cameos in this short video. 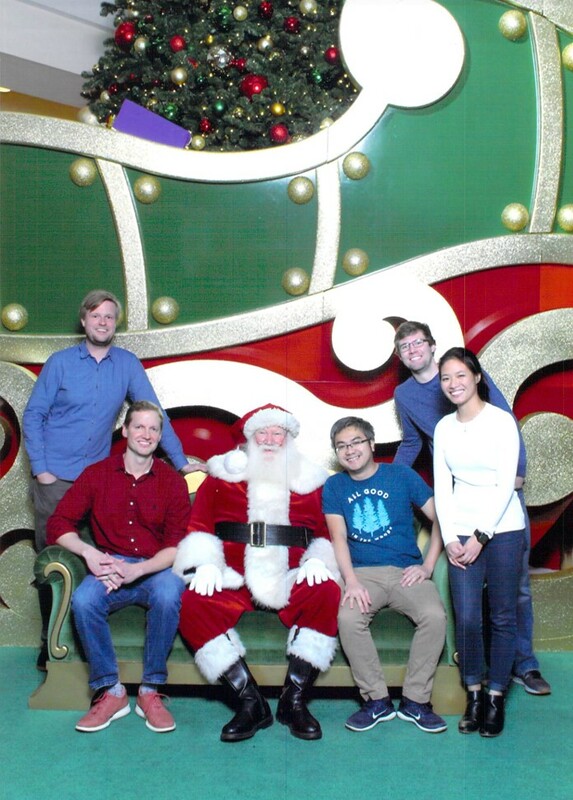 After a Holiday Feast at Penguin Ed's BBQ, members of the Z lab descend upon Santa for our annual lab photo. Sruthi Ravindranathan, Sean Smith, Michaela Mertz, Ethan Lowry, Katie Wilson and Cassie Walker presented their latest research findings at the Biomedical Engineering Society 2014 Annual Conference in San Antonio. And then of course....margaritas!! 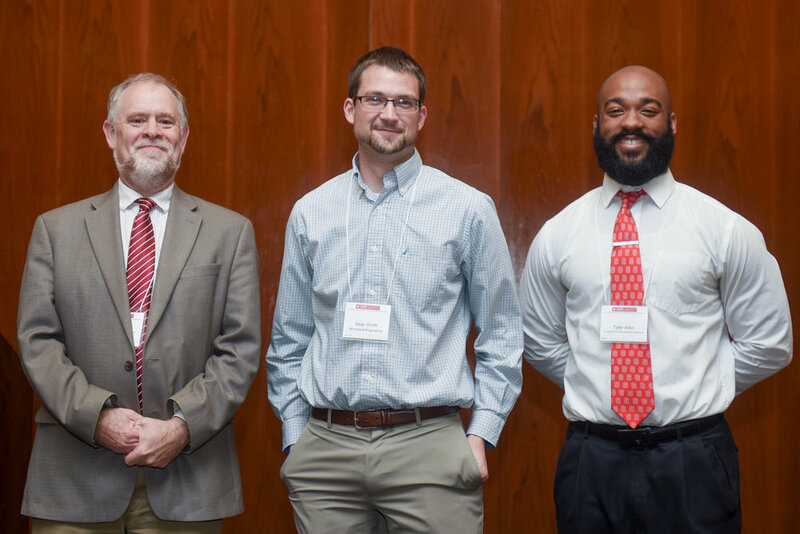 Biomedical Engineering Assistant Professors David Zaharoff and Jeff Wolchok talk about their research and the recent upswing in NIH funding at the University of Arkansas on "Ozarks at Large", a locally produced news magazine. The podcast can be found here. The Zaharoff Lab, in collaboration with Dr. Suresh Kumar's lab, was awarded a 5-year $1.5M grant entitled "Biopolymer-based strategies for local delivery of cytokine therapeutics" from the National Cancer Institute. This project will develop cytokine bioconjugates to enhance intratumoral retention and immunotherapy efficacy. Congratulation to Biomedical Engineering/Biochemistry double major Sushanth Kumar for receiving Honorable Mention in the Barry Goldwater Scholarship competition. The Zaharoff Lab was awarded a 3-year $416,897 grant entitled "Intravesical Chitosan/IL-12 Immunotherapy for Bladder Carcinoma" from the National Cancer Institute. This project will extend preclinical studies to explore local-to-systemic anti-tumor immunity following intravesical administration. For older Zaharoff Lab news, click here.